On to Hornpipes. Like reels, in 4/4 time, but have a different feel to them despite the same time signature. And I must say, I do have a fondness for them on banjo! Okay, first one we’ll do is Rights of Man, but since we missed a week due to Sandy, I’ve tagged on Boys of Blue Hill as well! One reason I chose Rights of Man first is that there is a very good opportunity in the A part to substitute triplets, eighth notes and quarter notes as variations (notation has the quarter note and eighth note approaches). You can hear some of it (quickly) in the recording, but we’ll go over it in class as well. The recording of Boys of Blue Hill actually has 3 hornpipes (comes back around to BOBH at the end). But since it was fiddle and guitar it seemed like a good choice, plus the kids playing it were just so cute and happy. Also, to follow-up with Scott’s question about how to make the tunes a little less monotonous, a couple of thoughts. First, especially for you fiddles and whistles (probably accordions too), playing it with a bit of a lilt (e.g. every eight note is not the same, some are longer than others – PINE-apple rather than pine-ap-ple) can make a difference. Also, you can add in (or take out) notes to vary rhythmic patterns. As an example, below I’ve changed the rhythmic pattern in the first measure of Merrily Kissed the Quaker (and the note as well) to show how you can create a variation to make the tune more interesting without really changing the basic tune. On the next measure (also 3 8th notes), you could leave out the B as well and mimic the same change in the rhythm. Give it a try and see what you think! Our 3rd (and final) jig is Stan Chapman’s by Jerry Holland. I’ve also heard it called Willie’s Trip to Toronto. It is named after a well-known Cape Breton fiddle player. If you haven’t heard Cape Breton fiddling, here is a sample played by, why, Stan Chapman! I think from the example, you can see why Jerry named the tune Stan Chapman’s. Lively, fun stuff! I like this one following Blarney Pilgrim because the A parts are similar, but Stan Chapman’s is up a key (G->A) and very major, so it provides some real “lift” at the end of the set. See if you agree! Here’s the notation (remember, you can leave out the first or second pick up notes in the B part – the high A and F# – or use them as variations). So, our second “jig” is called Merrily Kissed the Quaker, and I’ve seen it listed as a slide as well. Slides and jigs are certainly related, and many rhythm players will play a slide using a very rapid jig strumming pattern. But there’s definitely a different feel to where the rhythmic emphasis is between a jig and a slide. Anyway, we’ll play Merrily with a jig feel to it and it fits very nicely with Blarney Pilgrim. It’s also a 3 part tune (AABBCC) with a very recognizable 3rd part. To me, both these tunes set up the C part beautifully. Maybe that is one reason they seem to go together so well! 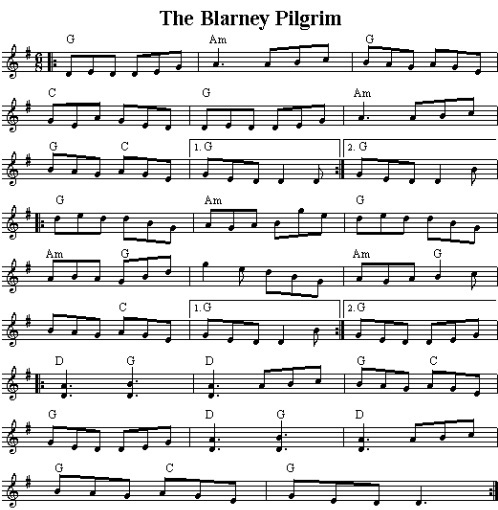 Our first jig is a delightful tune with a very recognizable 3rd part called Blarney Pilgrim. Yes, so this one is a 3 part tune (AABBCC) in the key of G (though the 3rd part begins on the D, or 5th, chord). Oddly enough, I couldn’t find a recording that I was thrilled with for various reasons, but here are two that will do. The 1st one kind of cracked me up. Listen to Blarney Pilgrim on whistles. Listen to Blarney Pilgrim with a new age kind of groove. Here’s the notation (with suggested chords). Here’s a link to a very full discussion on various Irish rhythms (perhaps more than you want right now) found on irishtune.info, a terrific source for information. Also of interest is a survey of people on the site who play various tunes, so you can see which tunes of each type are most popular. Again, another source for answering the question, “which tunes should I learn first?”. Here are the two tune compilations from O’Flaherty’s Retreat in Texas. 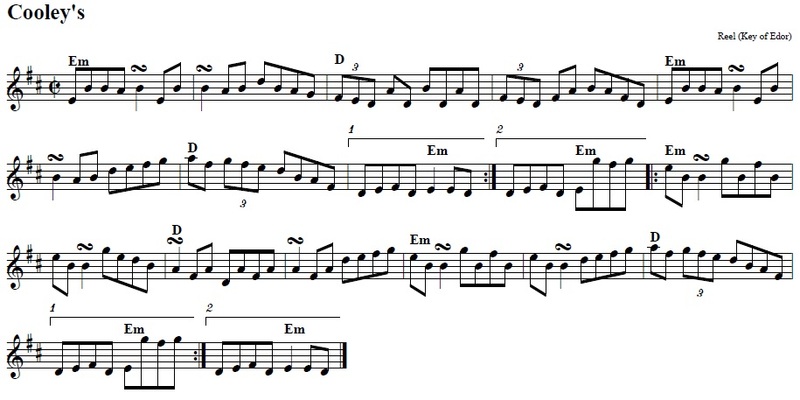 So our tune for week 3 is (Joe) Cooley’s, a two part reel in the key of E minor. This is a good choice as last year’s session class also learned it, it has been in the BRIMS repertoire for a long time (I believe it is even on the first BRIMS learning CD by Tes and Sara), and is also a KGB tune. Point being, it is played in Charlottesville regularly. Also, played at most slow jams at Swannanoa. Yes, this is one that should be in your tune list! Listen to Joe Cooley’s Reel by the Dubliners (can’t beat this banjo playing by Barney McKenna, Julie). Great set of tunes too! Here’s the notation (with suggested chords). Like last week, try playing the 3 reels together in different orders. What order do you prefer? If it were up to you, how would you arrange the set? 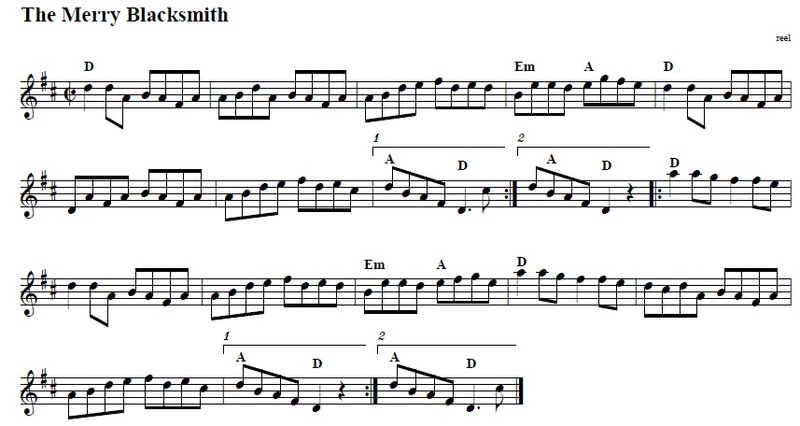 Merry Blacksmith is a 2 part reel in the key of D (again, reels are in 4/4 time – 4 quarter note beats to the measure). And, when I say a two part reel, I mean that it generally follows the pattern of AABB, meaning play the A part twice, then the B part twice. Sometimes there are some variations to the parts, but most of the time a two part reel will follow that pattern. So, one thing you might listen for when you hear a new tune is whether it is a 2 part tune (AABB) or 3 part (AABBCC) or something else. Below are two recordings of Merry Blacksmith by very famous Irish bands. One by Planxty and the other from, oddly enough, the same Solas workshop that provided Father Kelly’s. Listen to Merry Blacksmith (Planxty Live) Note that the tune begins at .35 in. Here’s the notation (with suggested chords). One suggestion for practice is to practice both tunes together but mix it up. One time Father Kelly’s first, next time Merry Blacksmith first.